The eighth week of easy dinner recipes has everything from hometown Philly Cheesesteak sandwiches to comfort food at it’s finest – baked ham and potatoes. This eighth week of menus wraps up a second month of delicious and satisfying easy dinner ideas complete with main dish and side dish recipes! If you’d like to print the individual recipes (instead of the complete weeks’ worth at one time), the link to each recipe is at the end of that day’s recipe. 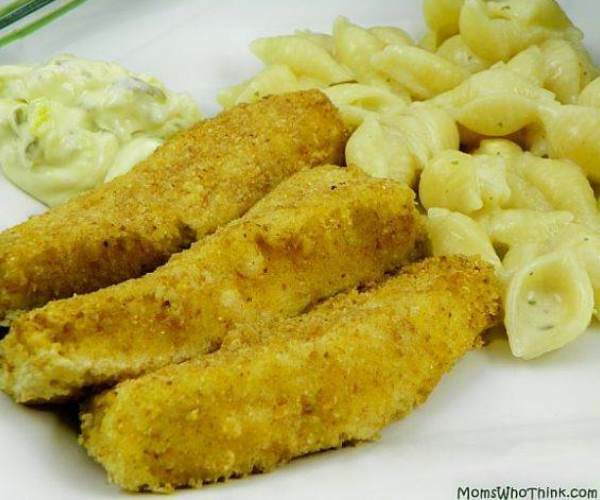 Fish sticks are the only way a lot of kids will eat fish, and this simple recipe is a winner every time. Served with the all-time favorite buttered egg noodles and this is a meal you won’t have to worry about the kids eating. 1. Wash the fillets, then pat them dry with paper towels. Cut them into long pieces. 2. Spread the bread crumbs out on the waxed paper. Break the eggs into a bowl and mix up with a fork. 3. Dip each strip of fish into the eggs, then roll it around on the bread crumbs until it’s coated. Lay each fish strip out on the baking pan. 4. Melt the butter in a small pan over a low heat and carefully pour it over each of the fish sticks. 5. Bake in a 400 degree oven until golden brown (about 15 minutes). 6. Serve with tartar sauce (½ cup mayonnaise mixed with 1 chopped up sweet pickle plus the juice from 1 lemon). 7. Serve with buttered egg noodles tossed with garlic powder. Some stories say that one of the early ranch hands at King Ranch in Texas came up with the dish and fed hundreds of hungry ranch workers this hearty meal. You may not need to feed such a big crowd, but this famous recipe is sure to please all the cowpokes in your house. 2. Make the sauce by melting the butter in a heavy skillet over medium-low heat. 3. Add the garlic, cumin and chili powder, and sauté for a minute or two. 4. Raise the heat to medium. Quickly sprinkle in the flour and stir to mix. 5. Pour in a small amount of the chicken broth, stirring constantly to remove lumps. 6. Gradually add the remaining chicken broth and the buttermilk and continue stirring until sauce has thickened, 3 or 4 minutes. Add salt and pepper to taste. 7. Make the filling by warming a heavy skillet over medium heat, then adding the olive oil. 8. Sauté the chopped onion, green pepper, poblano, chiles and tomatoes until onion is transparent, about 4 or 5 minutes. 9. Fold into the mixture the shredded chicken and green onions, combining well. Remove from heat. 10. In a small skillet, heat about half an inch of canola oil. 11. Using tongs, dip the tortillas in the hot oil one at a time, for just a few seconds, so that they are softened. 12. Cover the bottom of the baking dish with 4 of the softened tortillas. 14. Bake for 30 minutes at 350 degrees F until casserole is heated through and bubbly. 15. Serve with a tossed salad and your favorite salad dressing. Philly cheesesteaks have as many variations as there are take out places to get them in Philly. 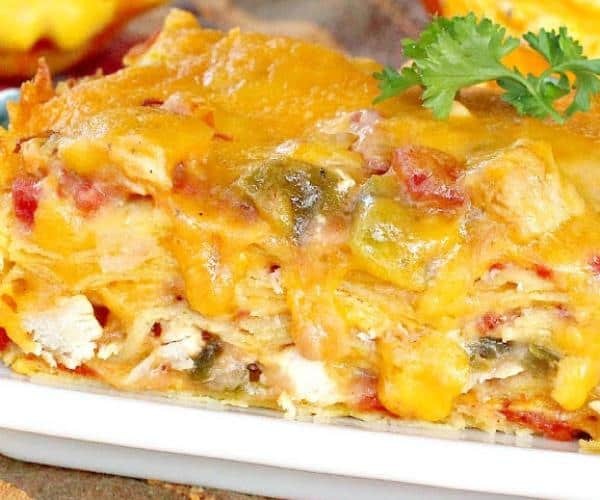 This recipe serves them up packed with peppers and onions and smothered in Mozzarella cheese. It’s one of our favorite sandwich night recipes. 1. 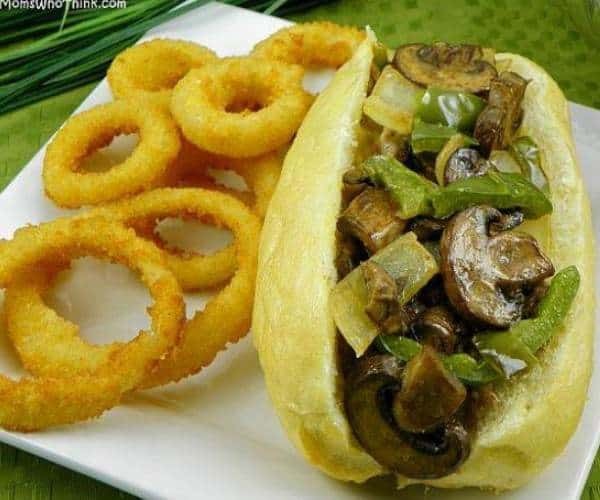 In a large skillet, sauté mushrooms, onions and green pepper in butter until tender. 2. Divide beef among rolls. Top with vegetables and cheese; replace roll tops. 3. Place on an ungreased baking sheet; cover with foil. 4. Bake at 350° for 15 minutes or until heated through. 5. Meanwhile, in a small saucepan, heat bouillon and water until cubes are dissolved; serve as a dipping sauce. 1. Slice 4 large onions into ¼-inch rings. Place in large bowl and cover with buttermilk. 2. Season with salt and pepper (season to taste). 3. Cover with plastic wrap and refrigerate for 30 minutes. 4. Place 2 cups flour in a shallow dish. Season with garlic powder, salt and pepper. 5. Dredge onion rings in seasoned flour. Dip again in buttermilk, then in seasoned four. 6. Fry in batches in a large skillet, in 350 degree oil for 2 to 3 minutes until golden. 7. Drain on paper towels. Let oil come back to temperature before frying next batch. 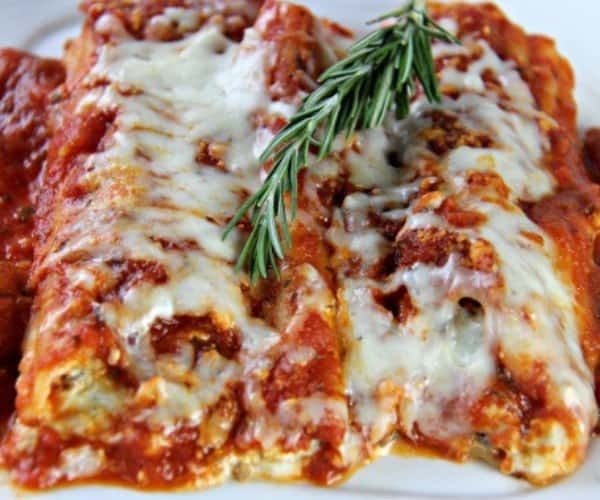 Manicotti gets leveled up with the addition of Italian sausage mixed in with 3 different cheeses and seasonings. This is the perfect dinner for planned leftovers or when you want to feed a crowd. It’s an easy casserole that shines at any potluck or big family dinner. 1. In a large skillet, cook sausage over medium heat until no longer pink; drain and set aside. 2. In the same skillet, bring tomatoes and marinara sauce to a boil. Reduce heat; cover and simmer for 10 minutes. 3. In a large bowl, combine the eggs, ricotta, Parmesan cheese, chilies, parsley, Italian seasoning, salt, garlic powder and pepper. 4. Divide 2 cups of sauce between two greased 13-in. x 9-in. x 2-in. baking dishes. 5. Stuff uncooked manicotti shells with cheese mixture. Place in prepared pans. Sprinkle with sausage; top with remaining sauce. 6. Cover and bake at 375 degrees F for 50 minutes. 7. Uncover; sprinkle with mozzarella cheese. 8. Bake 10 minutes longer or until cheese is melted and manicotti is tender. Let stand for 5 minutes before serving. 9. Serve with salad and warm buttered Italian Bread. 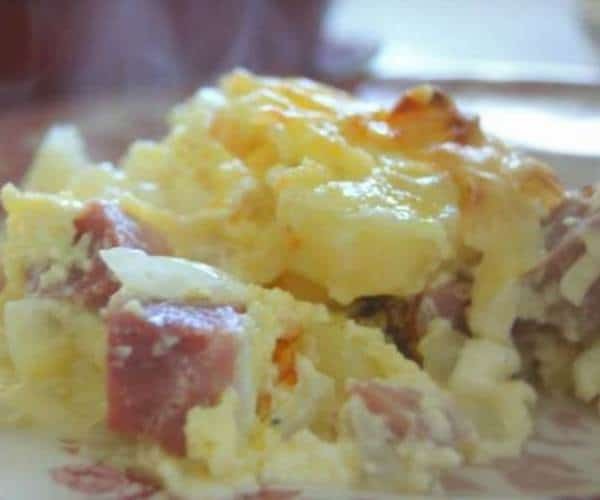 Leftover ham is reinvented in this comfort food classic casserole. A creamy sauce covers potatoes and ham to create a family favorite you’ll make again and again. 1. Preheat oven to 350 degrees F. Lightly grease a 9×13 inch baking dish. 2. Place potatoes in a large pot of water, and bring to a boil. 3. Boil until slightly tender, about 12 minutes. Drain, and transfer to a large bowl. 4. Mix sour cream, butter, cream of chicken soup, Cheddar cheese, green onions, ham, salt and pepper with the potatoes. 5. Spread mixture in the prepared baking dish. Sprinkle with bread crumbs, and drizzle with butter. 6. Bake 30 minutes in the preheated oven. 7. Serve with buttered broccoli. Homemade Salisbury steak is an old fashioned recipe that keeps showing up on dinner tables because it’s a comfort food that people remember from family dinners. Dinnertime can create wonderful memories, especially with classics like this recipe as the main dish. 1. In a large bowl, mix together ⅓ cup condensed French onion soup with ground beef, bread crumbs, egg, salt and black pepper. Shape into 6 oval patties. 2. In a large skillet over medium-high heat, brown both sides of patties. Pour off excess fat. 3. In a small bowl, blend flour and remaining soup until smooth. Mix in ketchup, water, Worcestershire sauce and mustard powder. 4. Pour over meat in skillet. Cover, and cook for 20 minutes, stirring occasionally. 1. Preheat oven to 450 degrees F. In large plastic bag, add all ingredients. 2. Close bag and shake until potatoes are evenly coated. 3. Empty potatoes into shallow baking or roasting pan; discard bag. 4. Bake, stirring occasionally, 40 minutes or until potatoes are tender and golden brown. 5. Garnish, if desired, with chopped parsley. 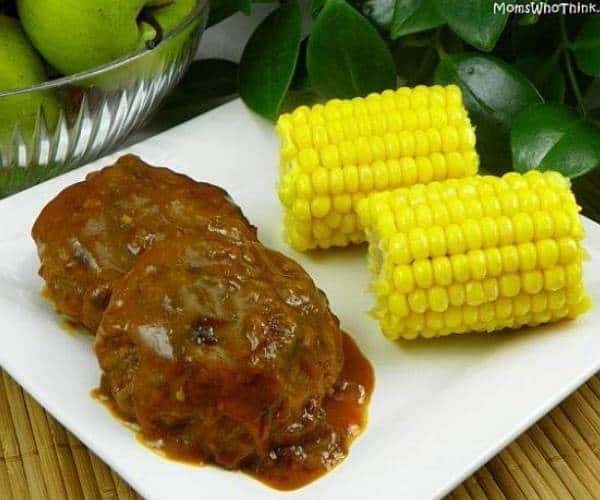 Serve Salisbury Steak and potatoes with buttered corn on the cob. 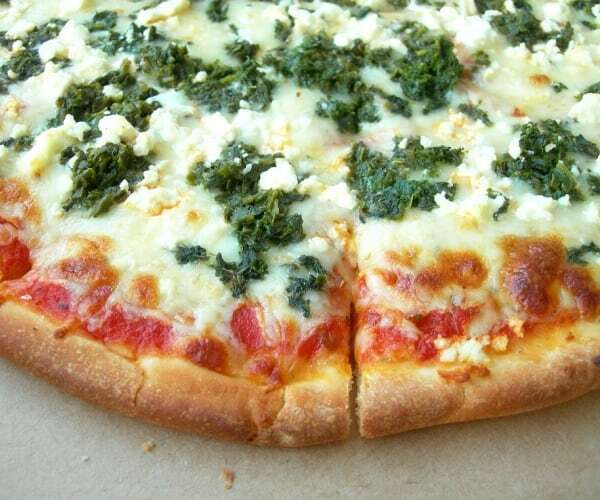 Pizza is easy to make at home, and white garlic pizza is a delicious version of gourmet pizza place pizza. Feta cheese steals the show in this recipe, perfectly blended with spices and vegetables for a taste explosion in every savory bite. 1. Preheat oven according to pizza crust package directions. 2. In a small bowl combine butter, olive oil, garlic, pesto, basil, oregano and Parmesan cheese. 3. Spread mixture evenly on pizza crust. 4. Arrange tomato, spinach, onion and jalapeno on pizza. 5. Top with crumbled feta cheese. 6. Bake according to pizza crust package directions.